Welcome to the Nebraska USSSA All State Showcase!! The All State Showcase will highlight players who have been nominated throughout the season at participating All State Showcase Events. Players are nominated for displaying great sportsmanship, effort and all around great tournament performance. Only players from Nebraska are eligible for the Nebraska All State Showcase. Players will be divided into teams and play in a two-game round robin showcase. 2 division of play during All-State Showcase: Maj/AAA and AA/A. Teams and schedules will be announced on the State Website the week of the event. Nebraska All-State Showcase tournament ring and be listed as a Nebraska All-State Player on the State Website. Team's coach will be asked to nominate players based on team's order of finish in each Nebraska USSSA Tournament in 2019. These nominated players will be the event's All-State Showcase Nominee’s. Selection of players will be finalized by the hosting organizations tournament director. 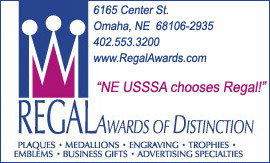 All players that have been nominated at Nebraska USSSA Tournaments will be posted on the results page of tournament at www.usssa.com as All-State Showcase Nominee’s. If you are interested in coaching, please apply so we have your information. Tournaments that have been approved are available on links below. If not listed, they have not been approved. CLICK HERE to access Teams Looking for Players. CLICK HERE to access Players Looking for Teams. E-Mail to get your request posted. Thank you for playing in this year's Battle of the Borders. Coaches were emailed with criteria on how to nominate players for the All State Showcase. Players nominated are eligible to play in the All State Showcase of their State. Check on All State Showcase information page to see what players have been nominated. Nebraska USSSA Baseball Classifications are based on Nebraska, and not on how they stack up against national competition. Classifications are based on power ratings, tournament results and by overall team performance on the field. The State Office will make classification adjustments during the 2019 season. Undoubtedly, not everyone will agree with classifications. Any team wishing to appeal a reclassification may do so after playing a minimum of six USSSA tournament games after January 1, 2019 against teams in their classification. Once the results for these games have been posted to the USSSA.com system, a review will be completed to determine if the team is competitive at the new level. The term "competitive" is and always will be subjective. A team that plays a little below or above .500 in any classification is competitive. A team that loses every game by one run is also competitive. Do your part to help the accountability of the USSSA system. View the other teams in your classification age group. If you feel a team is not in the correct classification or don’t see a team that should be listed send that information to me. We will flag that team and watch closely. If we get several on a team we will adjust now and not go through the underlined appeal process above. Team Rosters must be online before we can review. Our goal is to get all teams in the correct classification and with you help we will. The class system of play works if you are part of the accountability mechanism. USSSA is the only organization in the country that can make class play work as it should and monitor it. Teams may be reclassified at any time by the Nebraska USSSA State office. Nebraska USSSA Baseball encourages all USSSA baseball teams to purchase USSSA team insurance. Only USSSA Registered teams may purchase this insurance. USSSA team insurance covers the play and practice of amateur activities in the insured sport, including organized / sanctioned activities of other associations. Accident Medical Coverage: $100,000 Limit - Secondary to any other collectible insurance; primary if no other insurance is in force. Liability Insurance: $2,000,000 Limit - Lawsuits against players, coaches, sponsors, volunteers and league officials are increasing at an alarming rate. Play with peace of mind knowing you will be covered by one of the best sports liability programs available. Beginning August 1, 2018 teams can now purchase team insurance for the 2018/2019 season that will give the team coverage for the entire season. Coverage will last from 8/1/18 thru 7/31/19. Teams may still purchase insurance for fall only at 1/2 price. All 2018 Coach & Team Information has been erased. It is once again time to sign up for the 2019 season. This will allow all 2019 team and coach information to be accurate. There is no charge to sign up on the State Website. Click Here and select new to the site. Once you have finished you can Login and use the score ticker on right side of website along with many other options. USSSA Umpires can now register online and print their registration card immediately. Umpires must be registered to umpire USSSA games. Thanks for visiting the official Nebraska USSSA Baseball website. We are glad you are interested in playing USSSA Baseball, the fastest growing youth baseball organization in the world. If you have any questions, we hope this website will assist you in answering them. If not please contact, Ken Dirks the Nebraska State Director. Email me!